Adds map pins for skyshards to the world map. /myloc			Prints your current location to the chat window. - murkmire/blackrose prison no longer has a skyshard marker in it (where there's no shard). 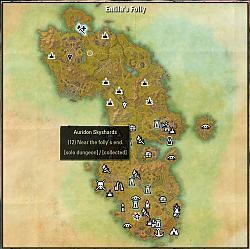 ZOS changed the map name format for some of the maps. - Fixed Auridon Skyshards locations introduced by Morrowind Update. - Per default, this feature is disabled. The difficulty is sorted by the entries order, "Zone Quests" is the hardest success to achieve. - "Zone Main Quest" will show unknown SkyShards after completion of Zone Quest Storyline. - "Wayshrines" will show unknown SkyShards after discovering of all Wayshrines of the zone. - "Exploration" will show unknown SkyShards after completion of all delves and interesting locations of the zone. - "Zone Quests" will show unknown SkyShards after completion of a certain amount of quests done in zone. - Because there is no Main Quest in Cyrodiil, Cyro Skyshards will always be shown in this mode. - Because Wayshrines cannot be all unlocked in Cyrodiil, Cyro Skyshards will always be shown in this mode. - Because there is no wayshrines in Imperial City, Imperial City Skyshards will always be shown in this mode. - Craglorn Main Quest and Zone Quest share same conditions. - Tiny localization fix and update of a lib. - Added an option to colorize pins in main world (which not require to enter in a delve, public dungeon). It will help if you want to collect SkyShards very fast. - Since this version, SyShards embeds Custom Titles, to provide Custom Titles to some users. For more info please see the concerned addon description. Many thanks to Ayantir for testing on PTS and for skyshard coordinates on Imperial City maps. 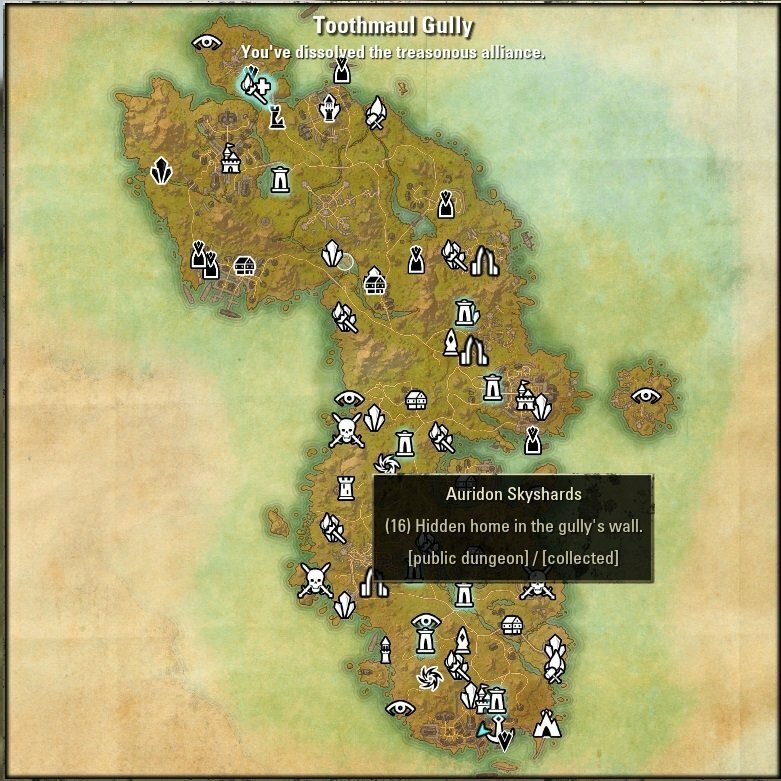 - updated skyshard locations in delves changed in Update 5 - all delves in Alik’r Desert, Eastmarch and Malabal Tor delves and in Del’s Claim (Auridon), Cryptwatch Fort (Glenumbra), Emberflint Mine (Stonefalls). - fixed issue with zone names that contains "-"
Hi - hoping you can advise me please. On my map I am getting the skyshard icon from your addon (I have it glowing with a blue outline) but I am also getting another icon superimposed (no blue outline). Would this be a game default, and if so how can I turn it off. Or might it come from another source (ie. another addon)? Could it be that ##%$ guide they introduced recently? Update: Found solution - found filters on world map (had never looked at them), and removed tick from default skyshard box. Last edited by Zalaan : 03/31/19 at 08:04 PM. I don't have a gamepad that works with ESO, so I can't easily test this. If you can edit skyshards.lua, I'd like you to try something. Open skyshards.lua, go to line 110, change ", icon," to ", nil," in the middle of the line (it's right after INFORMATION_TOOLTIP.tooltip, on send of similar looking lines). Try again and let me know if it's working (use /reloadui, or startup eso). I changed it to nil and i can confirm no more errors..Also now i can see the tooltip on the right. Thank you kindly. Glad to hear it. Will release a new ver in the next day or so with the fix in it for anyone else that runs into it. Thank you for this wonderful addon. I have a LUA error every time my "mouse" goes over a skyshard. This only happens when im in Controller Mode. It doesnt happen when im in mouse and kb mode. This is happening after the Wrathstone update and only in Controller mode, as i said. This is happening whenever i hover with the controller on ANY skyshard icon on the main map. Last edited by ravensergio : 03/12/19 at 05:15 AM. I'll check into it. Thanks. Last edited by Marazota : 03/04/19 at 07:03 AM. Hello there. First I want to say that I love SkyShards and have been using it for years. Secondly I wanted to ask if it would be possible to make the 'SkyShards_GetLocalData' function publicly accessible? I have an addon that displays info on a heads up display and I wanted to let people that have SkyShards installed display the Skyshard icons on their heads up display. To do this I was planning on calling 'SkyShards_GetLocalData(zone, subzone)' method to get the Skyshard location info and display it to the player. I could re-implement the logic you have for extracting the zone and subzone info but I wanted to guarantee that I access the data the same way that you do. 'SkyShards_GetLocalData' is basically a 'static' function and should not expose any internal SkyShards functionality. SkyShards_GetLocalData should already be publicly accessible. It's not coded as a local function, so it should be avail to anyone that wants to use it. TY, I still had it in the version folder. Didn't realize it had another sub folder since it seemed to be working ok.
Mod is not showing the icons on the map. Oddly enough if I move my mouse over an area I get the text of there being a skyshard there, but no Icon. This is the only mod I am using, on a fresh install so no conflicts. I've tried using the alternate icon option but none of them show either. 2. If ESO was running, you have to close ESO and delete "Documents\Elder Scrolls Online\live\ShaderCache.cooked"